In connection with writing this book entitled My Beloved Alaska Hills, I must mention how I got the thought of going to Alaska. In1907 I, like many other young men, came to the United States. On arrival in New York, after being released form Ellis Island by the immigration officials, I went to the Scandinavian Lutheran Immigration House, which seemed to be the way and custom of everybody at the time. At the home I met a countryman who had recently arrived from the Klondike in the Yukon Territory of Canada. In 1898 a gold discovery was made in that part of Canada. After it got to be known, thousands of men from many parts of the world came in quest for gold. The Swedish man had been one of the successful ones. He showed me a considerable amount of gold and told me he had got enough to go back to Sweden and retire for the rest of his life. Although it was interesting to see his gold, I must honestly say that it did not give me the feeling that I would someday be as successful as he had been. Rather it gave me a feeling of adventure and a sort of craving for something unknown to see and explore. That’s how I made up my mind to go west and finally some day arrive in the Promised Land. In those days it was not easy to get work. Also, as I was a newcomer, I had to learn enough English to be able to care for myself. First I got a job on a farm in the state of Connecticut, where I learned enough English to get by. I stayed on the farm nearly one year. In the winter of 1909 I worked in an electric elevator shop in Jersey City, New Jersey. That same spring, together with a Swedish family, I went as far west as Denver, Colorado. There I made a living at different jobs which happened to be available at that time. In the fall of 1911 I sent to Portland, Oregon, with a couple other young men and spent the winter. The following spring I bought my railroad ticket to Seattle and started for Alaska. This book will be no part fiction but the actual experiences of my life in Alaska for forty-three years. At Valdez we met a man named Joe O’Neal who worked as a guard in the city jail. During the summer of 1932 he was out on Middleton Island in the Gulf of Alaska when he heard we were gold-prospecting. He asked us to go along and stay on Middleton Island for the winter. Since O’Neal did not have money for provisions and his transportation, he had to look for a partner who was able to pay for both of these things. In the early days of Alaska we called it a grubstake to finance someone and if the venture turned out successful to get in on the good thing and if not to be out the same as the other fellow. A French-Canadian by the name of Fred Dazell, who operated a small restaurant in Valdez, went into partnership with O’Neal. In the first part of October after being in Valdez a couple of months, we bought steamship tickets on the Alaska Steamship Line for the town of Cordova, it being only a few hours’ journey between the two towns. In Cordova we stopped a few days and bought our provisions and the most necessary tools for out prospecting. We also bought lumber for three sluice-boxes. As John had his carpenter tools with him, he made the boxes while on Middleton Island. We were now ready to go to spend seven months on Middleton Island, but now we faced another hard problem: Could we get some boat owner to take us out to the island? Because it is in the open sea in the Gulf of Alaska and about 100 miles from the mainland and because in the fall one can expect more stormy weather, boat owners do not care to go out in the open sea at that time of year. However, we were lucky to get Fred Crocker, a mailman who carries the mail from Cordova to the town of Yakutak. We made a contract with Mr. Crocker to bring us to the island and come around May 20, 1993, to bring us back to Cordova. On the tenth day of October at 9:00 o’clock in the evening, we left Cordova. We followed the shoreline of Kotchebus Island about two-thirds before we changed our course and took for the open sea. Luck was with us in that the weather was fairly calm. Nevertheless, some of us had a touch of seasickness. About daybreak we caught sight of Middleton Island. As the island has no harbor, Mr. Crocker had calculated to get there at low tidewater and to get our outfits off before the incoming tide. As soon as he got the anchor down and the boat was standing still, he got the dory or small boat into the water; and we all got very busy filling the boat with our stuff. As we had to make many trips with the small boat, we had to work fast. We got O’Neal’s and Dazell’s outfit off first, as they were to live in a cabin nearby. Everything went well in getting the provisions on land except that on one trip a swell or wave went into our small boat, and we got part of our stuff wet, but not too bad. It had taken us about two hours from the time we arrived. We surely were glad to be on land, and likewise Crocker was glad to return to Cordova. For many years a man by the name of Ibeck and his wife had made their home on the island, engaged in raising blue foxes. They had leased the island from the Unite States Government. It was natural then that O’Neal, having been there in the summer, should move with his partner into Ibeck’s home. My partner and I stayed a couple of days and helped them pack their supplies, as it was about 500 yards to the cabin. About two miles south was a small cabin which Ibach had used in the winter when he was killing some of his foxes for market. The cabin needed some repair, so John set about to fix it up. Meanwhile I was packing our supplies over. By the time John had finished the cabin, I had most of our supplies packed. In three or four days we were comfortably settled in our little home. It stood on a high bluff on the west side of Middleton Island, where we stayed seven months. First I will tell the general geological description as far as I can remember. The Island is situated in the Gulf of Alaska 75 to 150 miles from the mainland and is approximately 13 miles long and one mile wide. The highest elevation is 120 feet. The longitude of the island is almost north and south. The island must have been born either by volcanic action or the mountains were ground down by glaciers during the ice period. There are two rock formations, granite on the east side and iron on the west side. The general color of the formation throughout the island is a darkish gray. On the east side there is a great amount of ruby sand, and on the west side there is the iron sand. It was very interesting how the ocean tide had shaped some of the formations as perfectly as a marble; and they were quite heavy, being almost pure iron. There is one act of nature I shall never forget. King David in one of his Psalms used this expression: “The heavens declare the Glory of God and the firmament sheweth His handiwork.” Psalm 19:vi. On the west side of the island we discovered a vein of razor clams about two feet in thickness embedded in the formation. Running in a 45 degree angle from west to east there was not a speck of gravel or rock dirt mixed, only pure razor clams. How did those clams get into this perfect condition in this formation of hardened conglomerate? Only God knows. The little placer gold found in several places on the island came from this formation of conglomerate. Someone had taken some samples for assay to the Alaska College in Fairbanks, and it assayed some gold. By now we knew some of the conditions of the island, and we set to work. My partner, John Conn, made the three sluice-boxes with the lumber had brought with us from Cordova, and I worked at prospecting to find if perhaps we would find gold worth while to use the boxes. There were a few places on the island where there was running water but not enough to give what the miners call a sluice-head, which means enough water to cause the gravel and sand put into the graded boxes to run out freely so iron-sand and gold settle in the riffles of the boxes. However, even having an inch of water running through the boxes would help. Wherever we saw gold near such places, we took advantage of the running water. Other places where we saw gold, we set up a box at a waterhole and used a wooden pedal and poured water by a bucket. In that way we separated the fine gold from the sand and gravel. We left no place where we saw gold untried. It was always after tidewater that we saw the gold which was brought in by the incoming tide. Therefore, we had a tide-table with us so we knew just when to be out to work. One time I was amused on behalf of my partner. We came to a place on the east side of the island where the tide had washed in a spot the size of 10’ by 10’, and the sand was just yellow with gold. I did not give it much thought as I had had years of experience with that fine gold on St. George Creek in the interior of Alaska. John, however, was quite excited over it. After we had cleaned it and weighted it, we got about two dollars. Such was the condition: It looked big but gave little of value. The most of our time and work in prospecting was done on the east side of the island because gold seemed to be more exposed by the tides than was the case on the west side where we had our cabin. We did not work on Sundays but stayed at home and rested. We worked hard during the week and enjoyed resting. There were two small sweet-water ponds near by our cabin where the mallard ducks stayed all winter. As I had brought my 16-guage shotgun along, we always had ducks. Sometimes there were a half dozen hanging in the woodshed. They were in fine condition all winter with a quarter inch of fat on their bodies. We sometimes invited our neighbors for Sunday dinner, and Mr. O’Neal was with us every Sunday. Dazell, though, was too lazy to walk the several miles between the two places. As we had not brought a radio along, we used to go to our neighbors to listen to theirs. In fact, O’Neal was good enough to let us use the radio to ourselves, as we liked to hear gospel services. I have often thought how true the Scripture is where it says, The Love of money is the root of all evil.” The adventure we had in connection with Fred Dazell was to bear this out. 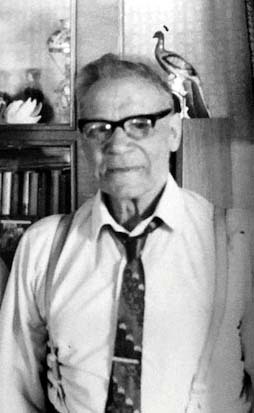 Fred Dazell, before he went to Alaska from Bellingham, where he and his wife had a restaurant, saw a fortune teller in Seattle before they left for Alaska. He related the story one Sunday night while his partner, Joe O’Neal, was making ready for a coffee snack. And so Dazell’s fortune, it seems, was read out of the palm of his hand. He was to make a journey far away, and so together with his wife Dazell went to Fairbanks in the Golden Heart of Alaska. At Fairbanks they started a little restaurant; but after a couple of years his wife grew tired of the restaurant work at Fairbanks and decided to return to Bellingham to her son, who managed the business there. After his wife left, Dazell got rid of the eating place in Fairbanks and went to Valdez, where he again started up a small place. Now Joe O’Neal had been on Middleton Island during the summer and had come back and showed Dazell a gold nugget. He remembered what the woman in Seattle had told him that he would make a million. Therefore, he was glad to buy an outfit for two and pay O’Neal’s transportation to Middleton Island because Dazell surely thought the million dollars was already in sight. However, after coming to the island, he would do nothing at all but sit in Ibach’s nice home watching the Swedes, as he called me and my partner, as we went out everyday somewhere to work. We were mostly investigating the east side. One day we went across the island opposite from where we lived. When we got on top of the ridge, where we could see the ocean, we noticed that the flat land where there was a lot of high dry grass was burnt off. It had been done a day or two before we came. We asked O’Neal if he had set a fire, but he said he had not. But he said that Dazell had been out in that direction several days before and that the wind was blowing towards our cabin on the west side. Dazell’s intention had been to burn us out so we would not be able to continue our investigation of the gold deposits on the island. He had said to his partner, O’Neal, “The Swedes are taking over the whole island and are getting all the gold.” Well, fortunately a rain came and killed the fire. About Christmastime O’Neal came and wanted us to divide up the food supply they had and for each one then to do his own cooking. Dazell accused his partner of giving away his food to the Swedes. On Sunday evenings when John and I visited them, O’Neal used to serve us coffee and Partner Dazell did not want him to do that. O’Neal did not want to divide food himself for fear they would get into a fight and Dazell would get hurt. Neither John nor I cared to do this job, but finally we agreed to go with him. Now O’Neal had told us to divide the food two-thirds for Dazell and one third for him. It was agreed that while John and I divided their food, the two partners were to be neutral and stay in the kitchen. However, as I was about to divide a slab of bacon, Dazell stood over me with a knife in his hand ready to use on me, accusing me of giving O’Neal the most, although the two-thirds part lay on Dazell’s pile of food. He just wanted to pick a quarrel with me. Fortunately, O'Neal heard him and came running. When he looked at Dazell, he said. "Frd, you look murder in your eyes. He took him back to the kitchen and sat by him until John and I finished dividing their food. Well, our time was nearly half spent on the island according to the agreement we had made with Fred Crocker. Conn and I worked hard trying to gather up that fine gold wherever we found it to help pay Crocker for taking us to the island. As for Joe O'Neal and Fred Dazell, things did not improve between them but rather got worse after their food was divided. Dazell became more and more nervous and harder to get along with. He never got out but sat in the cabin cursing the Swedes who got all the gold while he, who was to become a millionaire, as told by the fortune teller, got nothing. All this Joe O'Neal told us when he came to visit us several times a week. Toward the first of February, O'Neal told us that unless we would find a way to get Fred Dazell out of that cabin and out of the frame of mind he was in he would go insane. He said we would all three of us half to lock him up in a room and keep watch until Crocker came in the latter part of May to get us back. Thus, the rest of our time on the island would be ruined by Fred Dazell. Knowing what Fred had told us by his fortune being told by a woman in Seattle, who said that he would become a millionaire in Alaska, I made a suggestion. Since he had not any experience in prospecting and mining gold, he would be easily fooled by using a little caution and work to go along with it. Near our cabin on the beach lay an old boat, a shipwreck of many years. I had seen something like a large brass key on a door. This key we took and cut off three medium size nuggets, as brass has a color that looks like gold. These pieces or nuggets we put in the fire for a while and took off the rough places with a file. Next came the problem of how to get him interested enough so that he would get out of the cabin. O'Neal was working the sand close by where they lived, so he showed him the gold he was getting and insisted that Dazell should go out a few days. As O'Neal had some other work that had to be done, Dazell could use his sluice box. "Perhaps" O'Neal said,"you Fred, will do better than I. So Dazell went out with O'Neal. Dazell came home after three or four hours' work with a little fine gold. This he did for a couple of more days, and O'Neal could already see a difference as he enjoyed his meals far better. Well, the following Sunday evening when John and I came over , instead of O'Neal treating us with coffee and cake, it was Dazell. He showed us the nugget and told how his luck had started all because what the fortune-teller woman had told him really had started to come true. In front of where Dazell was working was a rocky bluff; and, according to the -thatgold must have come from. Joe O'Neal thought that when the tide was high, The formation of the bluff was broken up by the tidewater and so was carried there where Dazell was working.. This idea by O'Neal was to keep Dazell's mind t that place, and so Partner Dazell kept working. A few days had gone and O'Neal came over on his usual visit. We all three of us were glad of the results we had already achieved in getting Dazell out of the cabin and excerising himself with some work. It had been a few days since O'Neal put the first brass nugget in Dazell's sluice-box , so we decided to give him more encouragement. This time it was agreed that the nugget should be put there when Dazell was not at work to avoid suspicion and he would get it at the end of his day's work when he washed out his box. That night when he came home from work, his joy and enthusiasm knew no bounds. He said to O'Neal, "you see how that the woman told the truth-that I would be become a rich man in Alaska." Of course O'Neal had to admit that it looked that way all right. The following Sunday evening after dinner, we were with O'Neal as usual to hear the services on the radio. Both John and I were astonished to see the effect those two brass nuggets had made on Dazell. He was altogether a new man. From a pocket book he took out two brass nuggets, and he told us he had found a rich gold mine and was coming back in the summer with more provisions and keep on working. Well, we all three who had had some experience in prospecting for goldadmitted that there was a great deal of luck going with it. Some would look for years, and we made ourselves examples of how we had been in many places and had worked hard but nothng like in Fred Dazell's case had ever come way. O'Neal had one brass nugget left. The largest of the three we made was dropped in Dazell's gold box. The next time John and I came, we had not been in the house five minutes until he brought out his pocket book and showed us the three nuggets and asked us if we had ever found anything like that on Middleton Island We answered that of a truth we never had. He said when his wife in Bellingham had her next birthday, he was going to send the largest to her for a birthday present . Well, our little mischief toward Fred Dazell turned out above all expectations. We had no more trouble, and our time was devoted to investigating the mineral resources on the island. Dazell worked every day until Fred Crocker came and took us back to Cordova about May 20. It was getting towards the middle of April and Springtime was in the air. John and I worked hard trying to get enough of that fine beach gold on the east side of the island to pay our expenses. All we had was $80 in fie gold, and in about five weeks Crocker would come. Both time and luck were against us. However, such is a prospectors life. With all the hard work he does, he either finds gold in paying quantity or he doesn't. But he always works and lives in faith that someday the fortune of luck will come his way and so he will be paid for all his work he spent in looking for it. Some will find enough to pay for years of hard work. Most of us will not. This is part two of our experiences on Middleton Island. Mr Ibach, formerly living on the island for 18 years raisng blue foxes, came up from Juneau and told us to get off his island. While at Valdez leaving for Middleton Island, we had heard of Mr Ibach and his wife being on the island for a number of year raising blue foxes. Therefore, John and I went to the U.S. Court at Valdez to be cerain we would not trespass or violate Ibach's legal rights on Middleton Island. We were told by the clerk of the court that Mr. Ibach had not paid the lease to the U.S. Government for four years and therefore he and his wife's legal rights on Middleton Island had become void. One morning in early April John and I were up early as we took in two tides in the day. I was making our breakfast when I heard John speaking to some men. I looked through our cabin window and I saw two men talking to him. They carried revolvers at their hips and one of them had a hunting knife. As one of them led the conversation with John, I understood that he must be Mr. Ibach. Since he was talking quite loud, I could hear him calling us "robbers" and "highway men" who had come on the island and were violating his legal government rights there. I stepped out and invited them in for breakfast. I told Ibach that he could talk over his grievances that he had against us in a sensible manner in the cabin. We told him we had made an inquiry at the courthouse at Valdez and were informed that the lease had not been paid in four years and that the legal rights had become void . However, he still insisted that we had no right to be on the island, and he held out an old license to prove he was right. Still, he would not allow us to see what year the license had been issued. He further informed us that Oscar O'berg, the owner of the boat that had brought them to Middleton Island, would ake us back to Cordova for $100 a man. We learned shortly afterwards that besides Ibeck and Oscar O'berg, there were seven men on board the boat which Ibech had brought along from Juneau. There was supose to be a mining engineer with them and mining equipment also so they could go ahead after they had gotten us off the island. This was Mr. Ibech's plan when he left Juneau. Hoever, it was as the old saying goes; "If I dig a pit for someone to fall into, I myself will be the victim". Mr Ibach aand Oscar O'berg went back to the men on the boat again that day. The following day Ibach came ashore with two other men from the boat. They moved into Ibach's home cabin at th north end of the island where O'Neal and Fred Dazell were living. Unfortunately, they had not thought of staying a couple of days before returning again to te rest of the party where they had a set-up of food and sleeping quarters. A very heavy storm arose; and since there is no shelter or harbor, it is very dangerous to anchor near the shore of the island in case an accident should occur and the anchor break. The boat would be battered to pieces against the rocks of the island. However, being in the late evening when the storm started, O'berg had to stay all night until the following morning before he could lift anchor and seek shelter at Hitchenbrook island . My partner and I prayed that God's mercy would protect the six men on the boat that night. It was a week before O'berg returned to Middleton Island. Meanwhile Ibach and the two men he had brought with him from the boat stayed in his old home where the two men lived, O'Neal and Dazell. Since they must have had very little food along from the boat, they had to eat the food of the two men living in Ibech's home. One of the men came over to visit with us, and some of the men had had their eyes opened towards Mr. Ibach. This man said, “Ibach has fooled all these men out here at Middleton Island by lying and misrepresenting everything pertaining to the island.” He felt ashamed of having to be obligated to O’Neal and Dazell for their meals because of Ibeck’s lying and getting them to go with him to the island. My partner and I told him he could come and have dinner with us daily until Oberg came back. Well, how true Scripture is. Ibach’s sin had already found him out. 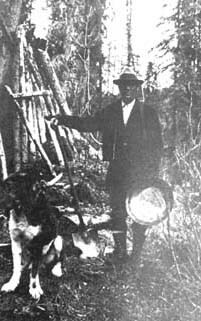 Before he had left Juneau, he had showed the men who went with him some coarse gold nuggets his wife had mined while he was raising blue foxes on the island. Since they had lost faith in Ibach’s truthfulness, they did not now believe that these nuggets came from Middleton Island. While Oberg stayed that week at Hinchenbrook Island sheltered from the storm, Ibeck had a dispute at his old home with the two men he had brought with him from the boat. They told him to his face that he was lying to them about that nugget gold and said that he had not got it from Middleton Island at all but somewhere else. One day as he was walking about the island, he dropped in to see us. Then he told us how the two men had accused him of fooling the party of seven men into coming with him to the island. Ibach was very indignant about being called a liar before O’Neal and Dazell and said that he was going to prove the truth to them. One morning at 5:00 o’clock I was out on the beach as my usual habit was to gather up some firewood which came into shore with the tidewater. In the sand I noticed footprints of a man coming from the direction of Ibach’s home. When I came in to make our breakfast, I told John that Ibach was out early. I could think of nobody else but Ibeck who would be walking about the island at that early hour of the morning. As Ibeck still had blue foxes, I said that he might be walking around to get an estimate of how many foxes he and his wife had left on the island. After Ibach came on the island, John and I decided not to do any work getting the little fine gold there was so as not to aggravate him any more than he was. It seemed as though he had enough trouble as it was. I corrected him by explaining that when he had seen the fine gold we had and had spoken of the coarse gold, I had said, “Maybe there is, but my partner and I have not found any.” I would not tell him that I was not yet convinced the gold he showed us was Middleton Island gold because he already had enough of irritation and trouble from the men he had brought out to the island. I was not able to get him to stay with us for lunch because he was most anxious to show the gold to the men who had called him a liar. I told Ibeck then that that since Oscar Oberg would undoubtedly return to Juneau and since he, Ibeck, would most likely never come to Middleton Island again, perhaps he would tell me and my partner the place on the island where he had got this gold. I said that we might get enough gold to pay Crocker at Cordova for bringing us to and from the island. As we expected, he would not tell. John then walked down to the beach again and found Ibeck’s footprints. After following them a little way, he found that the tidewater had already done its work by washing them away. Then John suggested to me that we go out right away and start in and prospect where John had lost the footprints of Ibeck. By afternoon we were digging seventeen holes in the direction Ibeck had found the coarse gold. Now, leaving the excitement for a while in trying to find Ibeck’s gold mine, we will come back to Mr. Ibach and his party of nine men whom he had brought from Juneau. I previously mentioned the storm which made Oscar Oberg and his men seek shelter for their lives at Hinchenbrook Island. They had just come back and were anchored close to Ibeck’s home. By now all of the men, including Oberg, had got wise to why Ibeck had talked them into going with him to Middleton Island. Ibeck had read in the newspaper of two parties of men outfitting at Cordova and going to Middleton Island to stay all winter, seven months, to prospect the island. Since Ibeck and his wife had lived many years on the island, they knew quite well the gold deposits all around the island. We were told by people at Cordova that Mrs. Ibeck was the one who did the gold mining while her husband took care of the foxes. The report was that Mrs. Ibeck would wash up to $50 when the tide was low. Since Mr. Ibeck knew all about his wife’s mining activities, it was natural for him to think we men had found it real rich, and so he got these men interested enough to go with him by showing them the coarse gold. Well, now that they had got to know the truth, that we had not got much gold, they got wise to Ibeck’s bluff and lying, and so half of the men were not even interested enough to go on shares. Mr Oberg finally got Mr. Ibeck and the two men who were with him on shore aboard the boat and returned. In closing the story of the Ibach expedition to Middleton Island, I will say that both Ibeck and Oberg have gone to their rewards. I’m told that Mrs Ibeck died and Ibeck’s statement to his wife was after she had passed away. He would follow by committing suicide. The Scriptures say that surely your sins will find you out. After the Ibeck party left the island, we started in again to try to locate the place where Ibeck that morning had got the coarse gold. One evening after being out several hours sinking holes to find the coarse gold, I said to my partner, “Let us quit sinking holes and go to the place where I’m sure Ibeck go the gold.” I told him a couple of times during the winter I had walked to the end of the island on the west side where we lived. About two miles from our cabin was a half-mile-long reef extending out in the ocean. It was covered with a tremendous amount of heavy boulders. On the 120-foot elevation I had seen a vein of yellow gravel imbedded in the gray conglomerate formation. It just appeared to me that his fold had come form that vein and in high tides had been breaking to pieces and washed and the gold released from the rock. However, John insisted that we keep on the way we were doing until we found the place. In that way we lost around three days of precious time because it was but a few days until we expected Fred Crocker to come and get us according to our agreement with him. When Joe O’Neal saw we were so busy, he offered to give us a hand, and so we took him on as a third partner. My premonition of where Ibeck had got the coarse gold turned out to be correct, as we did not get to find it until we came to that rocky reef. It surely was discouraging to look on that solid mass of big boulders which we would have to handle in order to get the gold from the bedrock. I went to the middle of the 100-foot-wide reef to get down a hole to see what was there. O’Neal went to the farther side and dug in toward me. He got his wash pan filled sooner that I did because he was closer to bedrock. After he had washed his pan of dirt, he came over to show me, and surely he had a good prospect of coarse gold in the pan. By then I was just scraping up the bedrock in my pan. I went and washed it. The result was that I got twice as much as O’Neal. The next day we brought a couple of sluice boxes. We agreed that O’Neal should wash the gold-bearing gravel and sand as John and I were getting it from the bedrock. John set to work and made a wheelbarrow because we had to carry the dirt several hundred feet to a waterhole on the ocean floor to be washed. We had marked the place where I got the good prospect the day before as we wanted to start where we had found the best. That day, through very difficult and hard work, we had taken up bedrock approximately six by six bedrock feet, and the gold result was over $22. It was good from so little space, but from a geographical point of view it was not good. We were lucky; it worked fine. So we knew each day that we worked on ground we had not worked on the day before. As John and I wanted to make enough to pay Crocker and our outfit, we worked two tides every day and stayed home and rested up on Sundays. I also did a little prospecting to find out how extensive the gold was on each side of where we worked but found nothing that would pay to work. So the big bonanza was only a narrow strip, and I do not believe there was over $25 left when we had to quit. Our hard work gave $300, so we made our expenses. Hermann Eckstrom was born in Sweden on June 29, 1887. Eventually, he returned to Sweden where me died at the age of 87. Coming soon! More on the life of Mr. Ibach, one of the early Alaska pioneers that raised Blue Foxes on Middleton Island! Home of Joe and Muzz Ibach on Middleton Island. Herman Eckstrum holdng his gold pant.